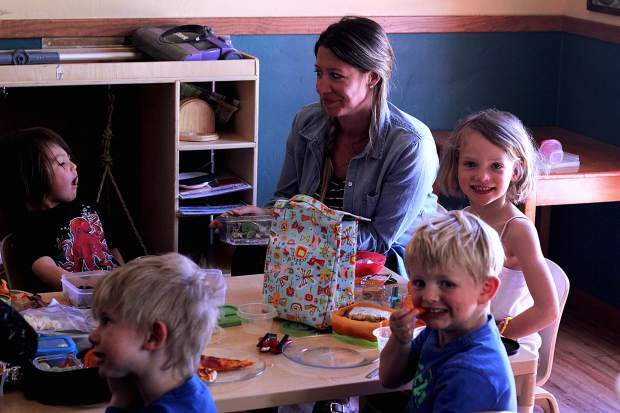 Ashley Donovan sits and eats lunch with her class at the Little Red SchoolHouse in Breckenridge. Teacher retention in daycare programs is one of the most important factors in quality child care. A new program will provide health coverage for 140 of Summit County’s child care providers. Individual day care centers did not offer insurance previously, leaving staff to fend for themselves and contributing to a high turnover rate. The EC Cares program is the result of a partnership between the Summit Community Care Clinic, Early Childhood Options and the Right Start Project, which is run by the county. “So many of our center’s teachers don’t have any insurance, or they’re underinsured and have high deductibles,” said Lucinda Burns, the executive director of Early Childhood Options. Jennifer McAtamney, the child care program administrator in Breckenridge, said providing teachers with health care is a means of increasing teacher retention. Turnover can have an impact on the children and how they bond with their teachers. Increasing teacher tenure can help to raise the overall care quality provided. McAtamney started in her position in May of 2016, after spending two terms serving on the Breckenridge Town Council, which created a child care committee in 2007. Later in August, she and members of Breckenridge child care centers met with Early Childhood Options to develop a solution to teacher health care problems in the county. Burns said that teacher surveys showed that a lack of access to health care was a barrier to many working at Summit’s child care centers. After meeting with Helen Royal, the CEO of the Summit Community Care Clinic, stakeholders were able to develop a program for the whole county. Board members at Early Childhood Options had recently approved the 2017 budget for the Right Start Project, prioritizing retention and recruitment. The project helped to fund the new EC Cares program. The Right Start Project was started after Summit voters approved a tax initiative in support of child care and learning in 2005. “These teachers, they have four-year degrees, they have credentials in early childhood, we want them to think about this as a real profession,” McAtamney said. The new EC Cares program allows teachers from licensed care facilities to visit the Care Clinic’s main location, or any of the school-based health center sites, for well care, acute care and behavioral health care. Royal said she hopes EC Cares will help to lay the groundwork for similar programs for other workers in Summit County. Morgan Thompson, the assistant director at Little Red SchoolHouse in Breckenridge, said that behavioral health is an asset to care for teachers, which can be a high-stress job. “Knowing that there’s that reprieve, or that support … it’s a great program,” she said. Thompson added that she is on her husband’s insurance plan but that the program is still beneficial because she can access care without having to use their high-deductible policy. Megan Matza, a teacher who has been with Little Red for more than 11 years, agreed, saying copays on her private insurance plan can be pricey. “If I have a cold, or something minor, I’m less likely to go to the doctor until it gets extreme,” she said. She added that the only drawback is that she can’t use the program to see her personal doctor that already knows all her medical history. Royal said that this program is built to help teachers, who are often exposed to germs and illnesses from children at care centers. By keeping teachers healthy, it, in turn, helps the kids stay healthy. McAtamney said that healthy day care providers are a benefit to the community as a whole.